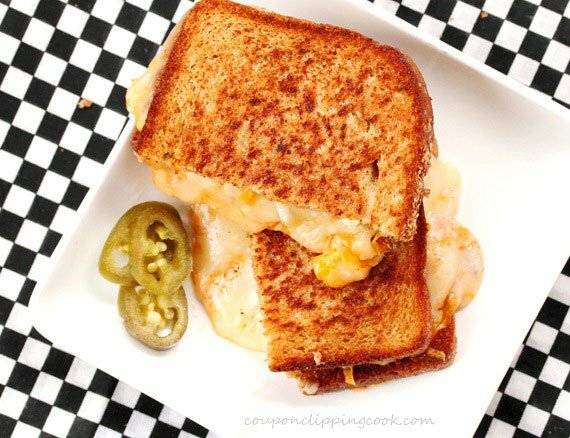 There’s no way around it, a grilled cheese sandwich is simple goodness. 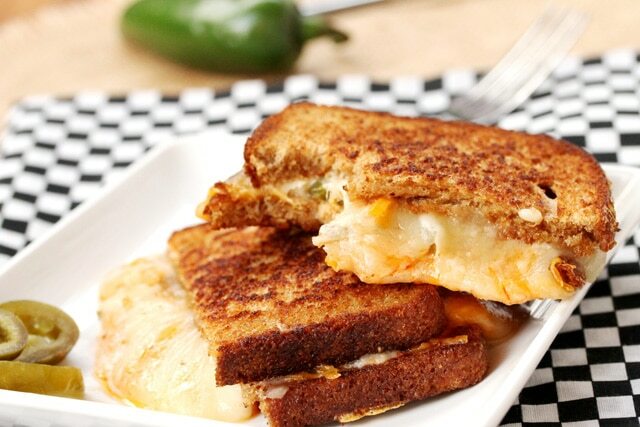 Although its super tasty as is with just cheese, a grilled cheese sandwich can be jazzed up by adding more ingredients like in this spicy nacho jalapeno and salsa version. 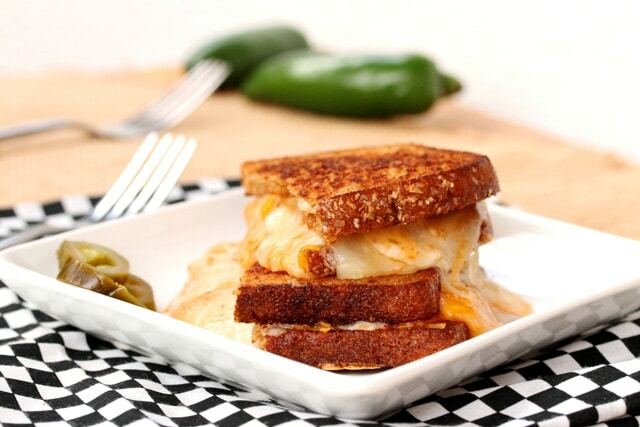 The heat of the jalapenos and salsa tastes downright amazing with the melted cheese and toasted bread. This is a sandwich worthy of having for breakfast, lunch or dinner. 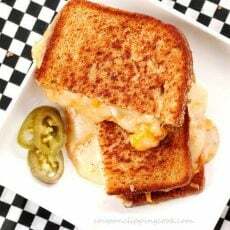 Here more grilled cheese sandwiches you may like; Brown Butter Grilled Cheese (made with onion rings inside the sandwich), Grilled Cheese and Chili Sandwich, and Three Cheese and Orange Zest Grilled Cheese (grilled on the BBQ). 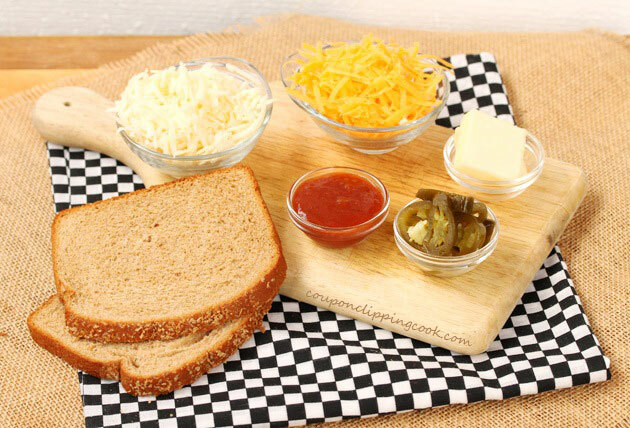 Depending on the size of skillet or flat grill used, one sandwich may need to be made at a time. 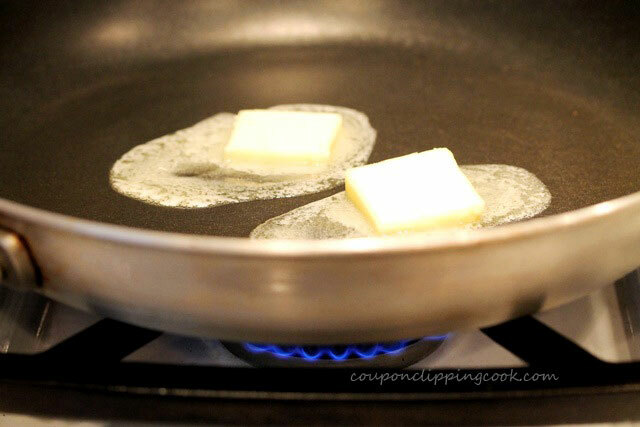 Heat a skillet on medium heat and add butter (add half of the butter if making one sandwich at a time). lay each piece of bread on top of it just enough to coat each side of the bread with the butter. 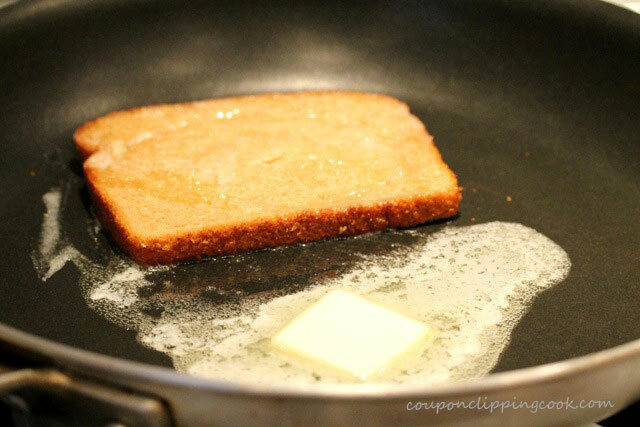 Lift the bread slightly with a spatula to take a peek at how fast the bottom side of the bread is browning. turn the bread over and add the cheese on top. Then top with jalapenos and salsa. 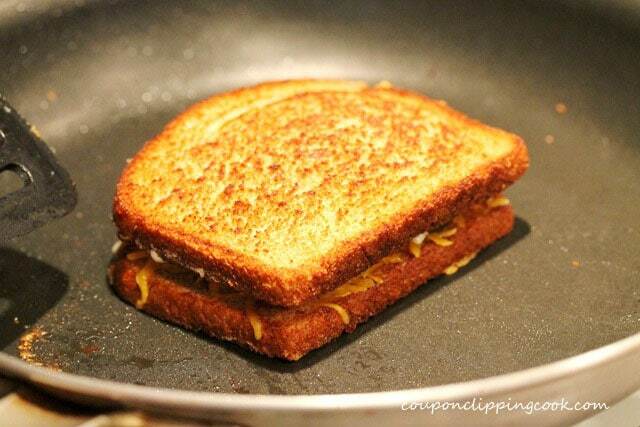 Put a lid over the pan and continue to cook the sandwich until the outside pieces of bread are lightly browned and the cheese is melted. Spicy and cheesy, a match made in heaven. 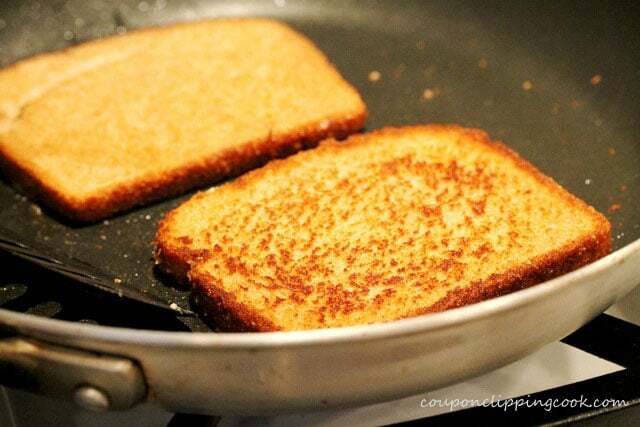 As the butter melts, lay each piece of bread on the butter just enough to coat each side of the bread. 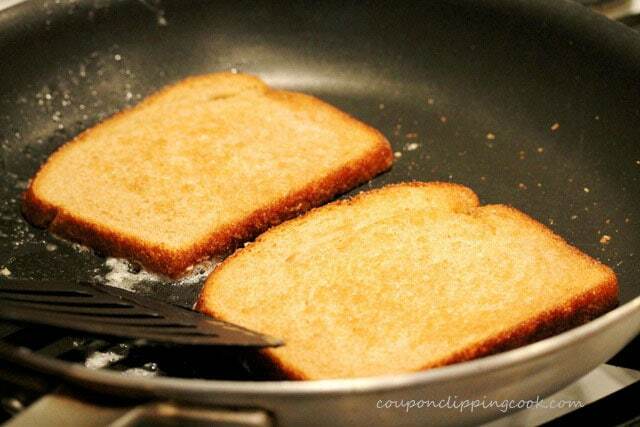 Lift the bread slightly with a spatula to check if the bottom side of the bread is starting to turn a golden color. 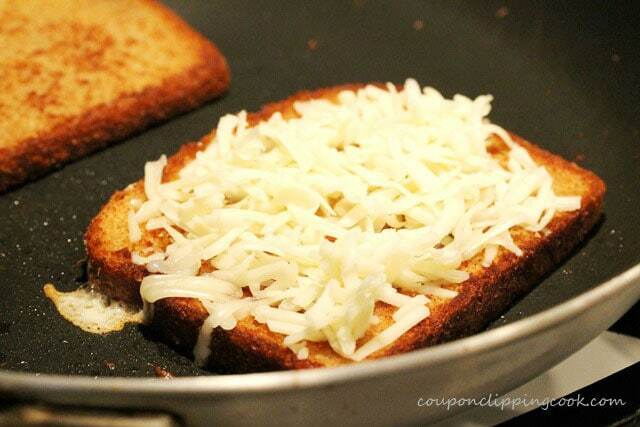 As soon as the bottom sides of the bread are a golden color, turn the bread over and add the cheese on top. 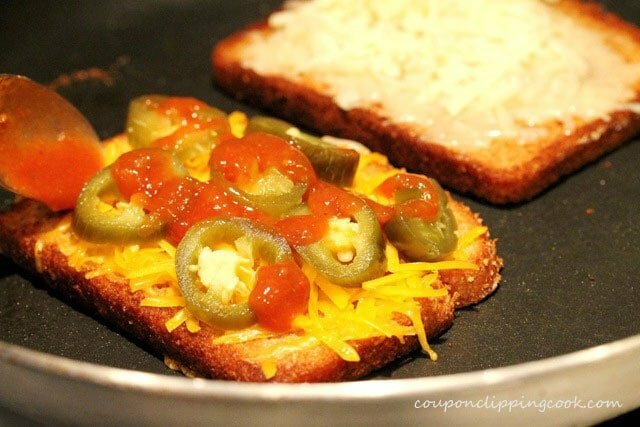 Then top the cheese with jalapenos and salsa. Carefully turn one side of the bread over on to the other one to make a sandwich. 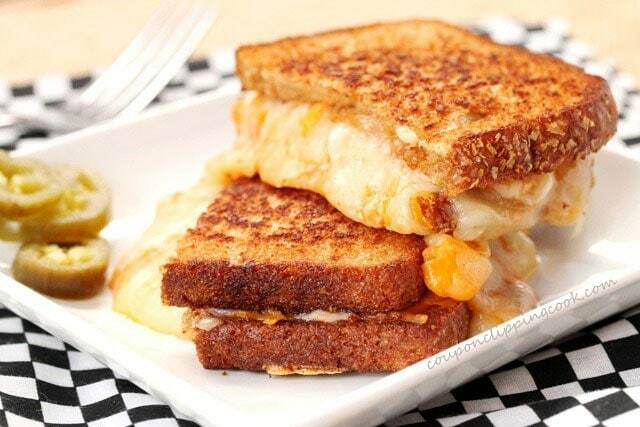 Love this grilled cheese. It amps up the flavour plus it just looks smashing. I must try this. 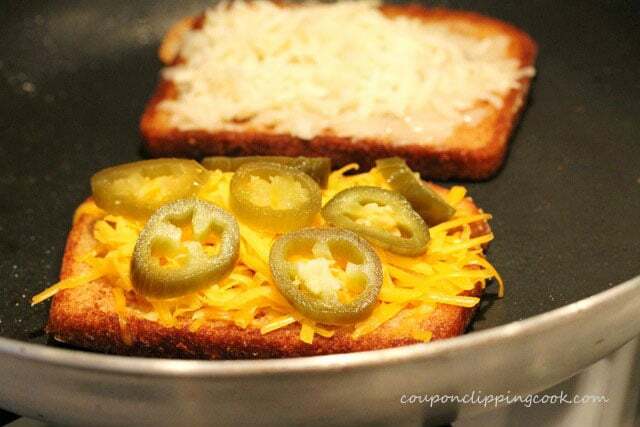 Ok. You had me at the picture “add the jalapenos and salsa”! I’m sold and ready to go home and make this. (Yes, I’m at the office drooling!). We have a new party at Tumbleweed Contessa. (What’d You Do This Weekend?) I’d love it if you would bring this over. It would be a hit! Grab a button and look around at what everyone did this past weekend. Thanks for sharing. You made my day. Hi Linda, hopefully it didn’t make you too hungry at work! I’ll be stopping by to check out the new party at Tumbleweed Contessa. Thank you so much for stopping by. Have a great day.